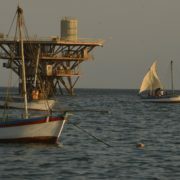 Traditional sail powered fishing craft below Oil Platform 10 on the Peruvian north coast. Used with permission by someone who preferred to remain anonymous. 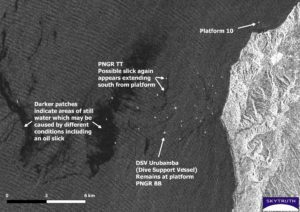 Last month we learned of an oil slick that had been sighted off the north coast of Peru in proximity to a number of offshore platforms. The slick was first observed by local fishermen in January and was reported in the press. At the time SAVIA Perú, which operates platforms in the area, stated that they had inspected their facilities and were not responsible for the leak. We’ve now had a look at Sentinel-1 satellite radar imagery of the area over the past few months. 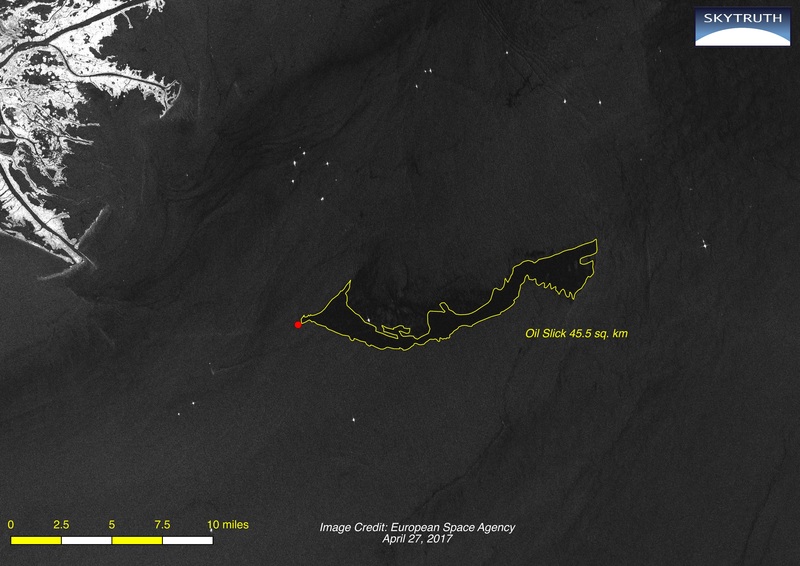 This imagery, provided by the European Space Agency, does show a possible oil slick extending about 14 miles from one offshore platform on February 3rd. 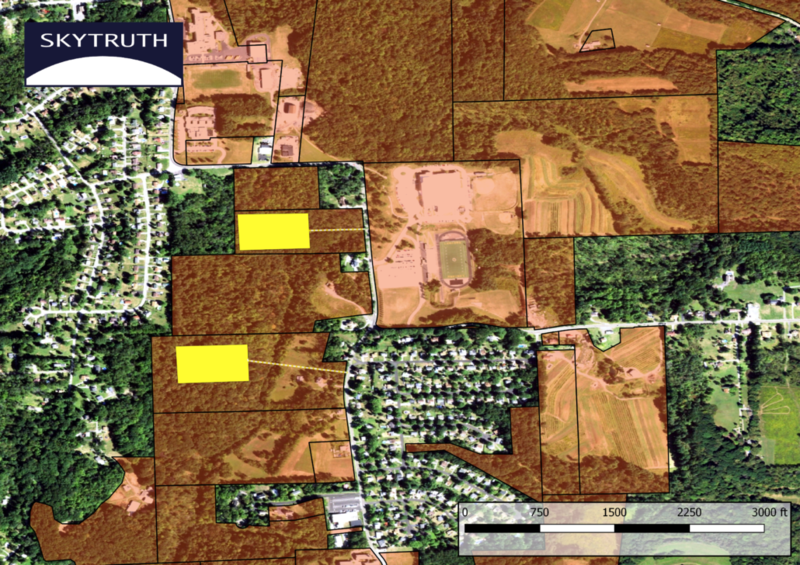 Imagery from the weeks before and after the reported slick may also show some evidence of chronic leaks in the area. 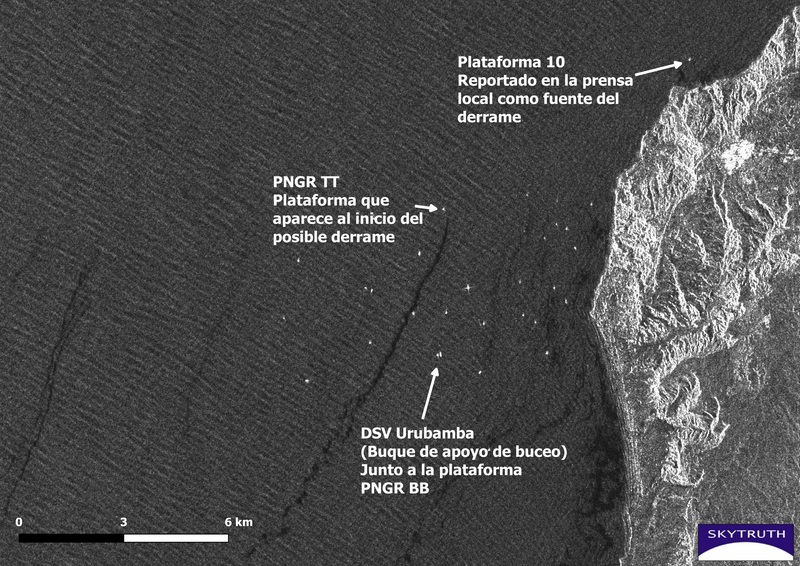 While initial reports in the press named Platform 10 in the area as the likely source, the imagery shows a possible slick extending from a different platform, Peña Negra TT (PNGR TT), also operated by SAVIA as part of lot Z-2B. 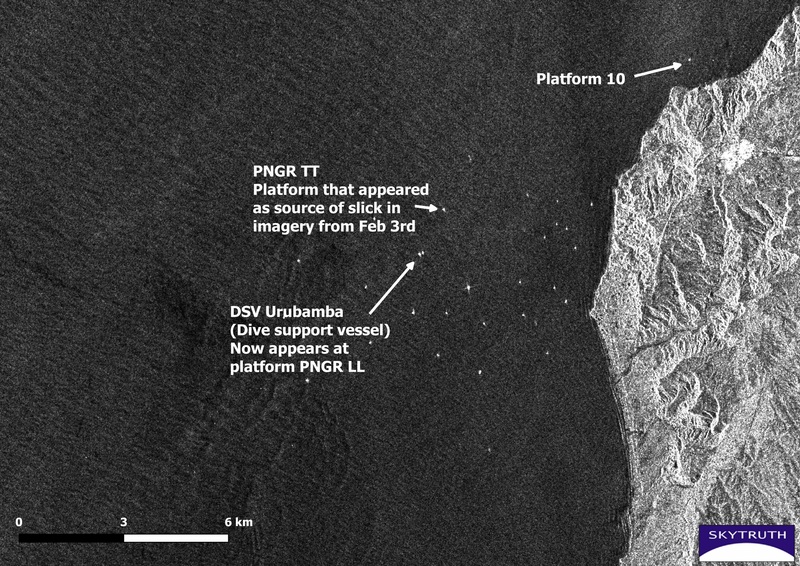 A dive support vessel Urubamba is also seen alongside another platform further south (PNGR BB) indicating there may be ongoing maintenance on oil infrastructure in the region. 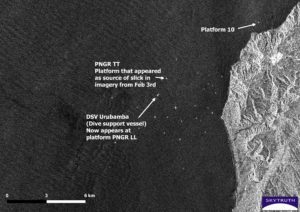 Sentinel-1 imagery from Feb 3, 2017 showing a possible oil slick extending from a platform on the Cabo Blanco area of Peru’s north coast. Image courtesy of European Space Agency. Two additional Sentinel-1 images are below, from March 11, 2017 and April 16, 2017. 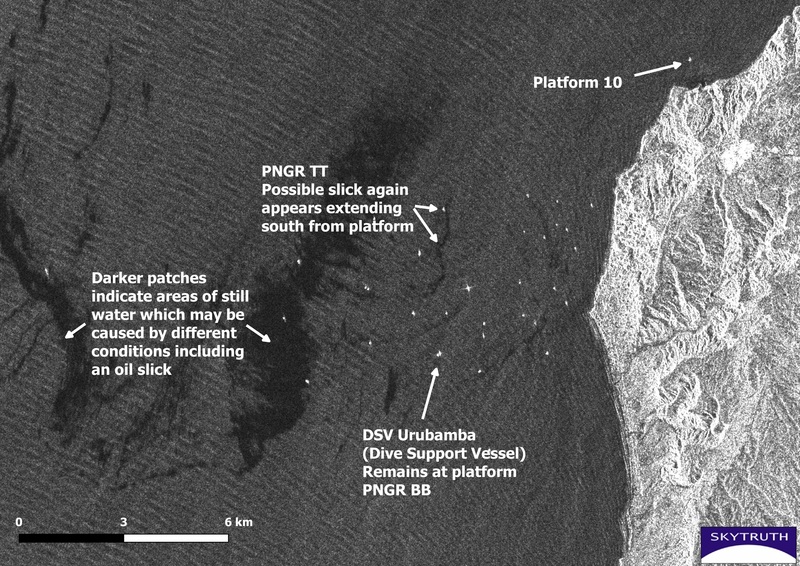 On March 11th we again see a possible oil slick extending south 1.8 miles from platform PNGR TT. However other larger dark patches also appear on this image making it difficult to interpret. These patches are areas of relatively flat water which could result from a sheen of oil on the water’s surface but could also be from other causes such as blooms of phytoplankton or even an area of heavy rainfall. 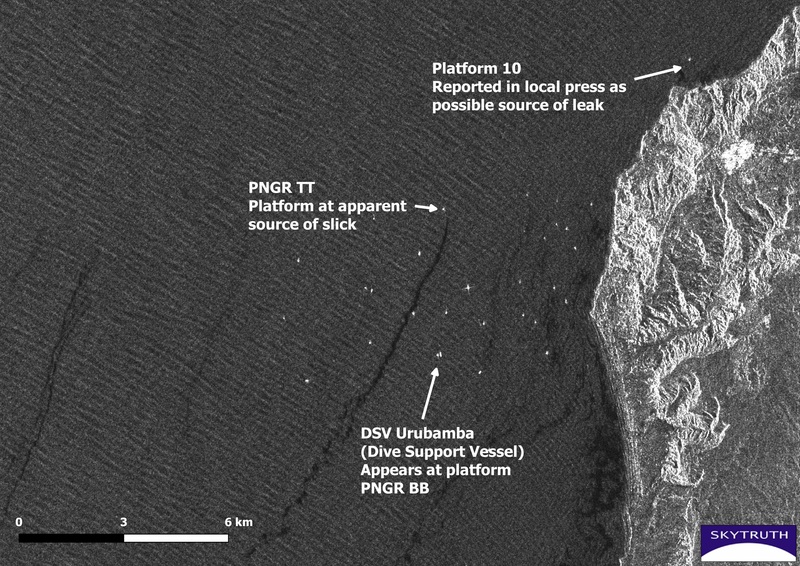 Recent imagery from April 16th shows no indication of any oil slicks in the area. Sentinel-1 imagery from March 11, 2017 again showing a possible slick extending south from well PNGR TT. Large dark patches to the west indicate areas of still water. Image of courtesy European Space Agency. Sentinel-1 imagery from April 16, 2017 shows no indication of possible oil slicks in the area. Image courtesy of European Space Agency. Along with extensive oil infrastructure, this area has the highest marine biodiversity on Peru’s coast and for that reason has been proposed as part of a new marine protected area. Under proposed legislation oil companies operating in the area could continue provided they complied with environmental regulations. We can’t be certain who was responsible for the oil washing ashore a few months ago but as this imagery shows there is reason for concern regarding this particular platform (PNGR TT) and continued monitoring of oil platforms in this area will be essential if this unique environment is going to be protected. Tradicionales embarcaciones pesqueras con velas pasan por debajo de la plataforma petrolera 10 en la costa norte de Perú. 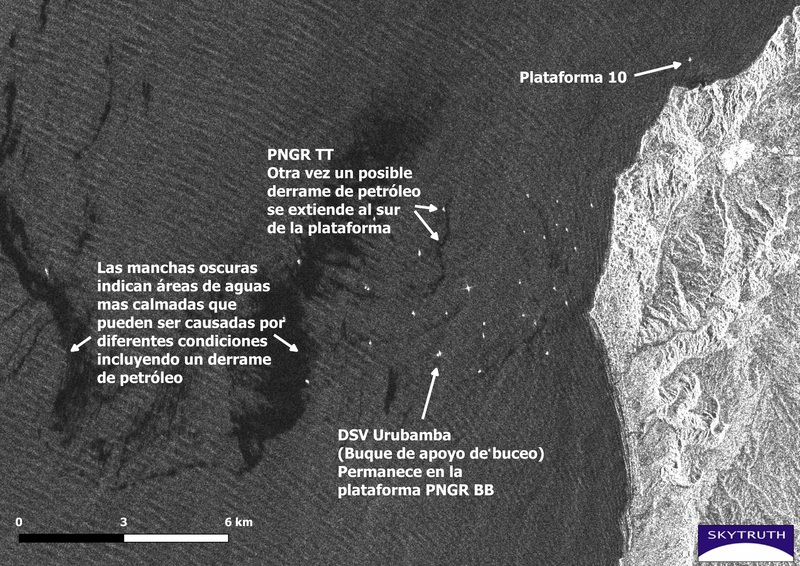 El mes pasado nos enteramos de un derrame de petróleo que fue visto en la área de Cabo Blanco en la costa norte de Perú en proximidad a unas plataformas petroleras. 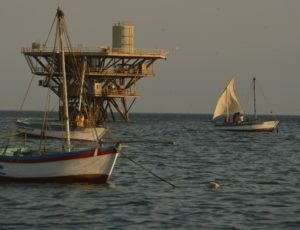 El derrame fue observado por primera vez por unos pescadores locales en enero y se informó a la prensa. A el momento SAVIA Perú, que opera plataformas en el área, declaró que habían inspeccionado sus instalaciones y no eran responsables por la fuga. Ahora hemos examinado imágenes del radar satelital Sentinel-1 durante los últimos meses. La imágen del 3 de febrero, proporcionada por la Agencia Espacial Europea, muestra un posible derrame de petróleo que se extiende a unos 22 kilómetros de una plataforma petrolera. Las imágenes de las semanas anteriores y posteriores a esta fecha también pueden mostrar alguna evidencia de fugas crónicas en el área. Mientras que los reportes iniciales en la prensa nombraron una Plataforma 10 como la fuente probable, estas imágenes muestran un posible derrame que se extiende desde una plataforma diferente, Peña Negra TT (PNGR TT) también operada por SAVIA como parte del lote Z-2B. 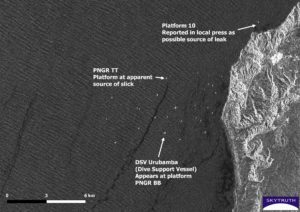 También se observó un buque de apoyo de buceo, DSV Urubamba, junto a otra plataforma más al sur (PNGR BB) lo que podría indicar que se realiza mantenimiento en la infraestructura petrolera de la región. 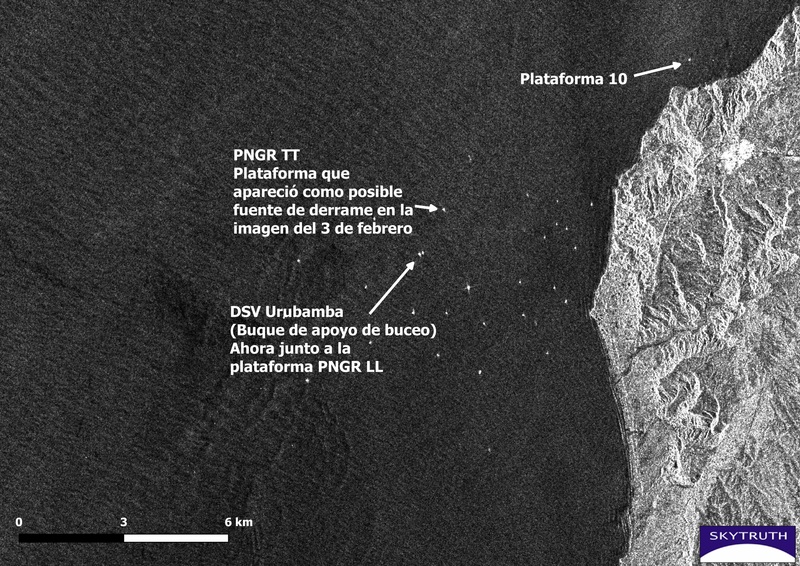 Imagen del Sentinel-1 de 3 de febrero 2017 mostrando un posible derrame que se extiende de una plataforma en la área de Cabo Blanco en la costa norte del Perú. Imagen cortesía de la Agencia Espacial Europea. 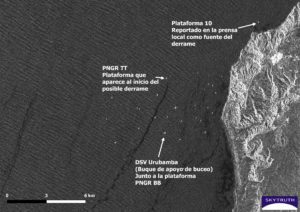 Dos adicionales imagenes Sentinel-1 están por debajo, del 11 de marzo y del 16 de abril de 2017. En el 11 de marzo volvemos a ver un posible derrame que se extiende 3 kilómetros de la plataforma PNGR TT pero debido a la presencia de unas manchas oscuras más grandes al oeste se torna difícil interpretar lo que aparece en la imagen. Estas manchas oscuras son áreas de agua relativamente plana que podría ser el resultado de la presencia de petróleo en la superficie del agua, pero tambien podria ser de otras causas, como las floraciones de fitoplancton o incluso lluvias fuertes. Un imagen reciente del 16 de abril no indica ningún posible derrame de petróleo en la zona. Imagen del Sentinel-1 del 11 de marzo de 2017 que otra vez muestra un posible derrame de petróleo que se extiende al sur de la plataforma PNGR TT. Las grandes manchas oscuras al oeste indican áreas de agua mas calmada. Imagen cortesía de la Agencia Espacial Europea. 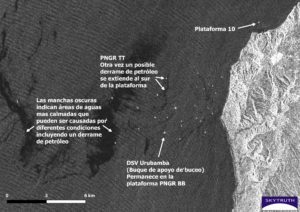 Imagen de Sentinel-1 de 16 de abril de 2017 que no muestra indicaciones de petróleo en la agua. Imagen cortesía de la Agencia Espacial Europea. Junto con una extensa infraestructura petrolera, esta área tiene la mayor biodiversidad marina en la costa peruana y por eso se ha propuesto como parte de una nueva área marina protegida. Según la legislación propuesta, las compañías petroleras que operan en la zona podrían continuar siempre que cumplieran con las regulaciones ambientales. No podemos estar seguros de quién fue responsable por el petróleo que llegó a la playa de Cabo Blanco hace unos meses, pero con estas imágenes se puede mostrar que hay motivo de preocupación por una plataforma en particular (PNGR TT) y que el monitoreo continuo de plataformas de petróleo en esta área sería esencial si este ambiente único va a estar protegido. Our collaboration with Global Fishing Watch on the problem of transshipment at sea in the fishing industry is at the forefront of a growing movement to take a critical look at this practice, which is increasingly regarded as a key driver of overfishing, and an enabler of illegal fishing and other fisheries crime including crew enslavement. Our work is funded by the Walton Family Foundation and being led by Bay-area skytruthers Aaron Roan and Nate Miller. 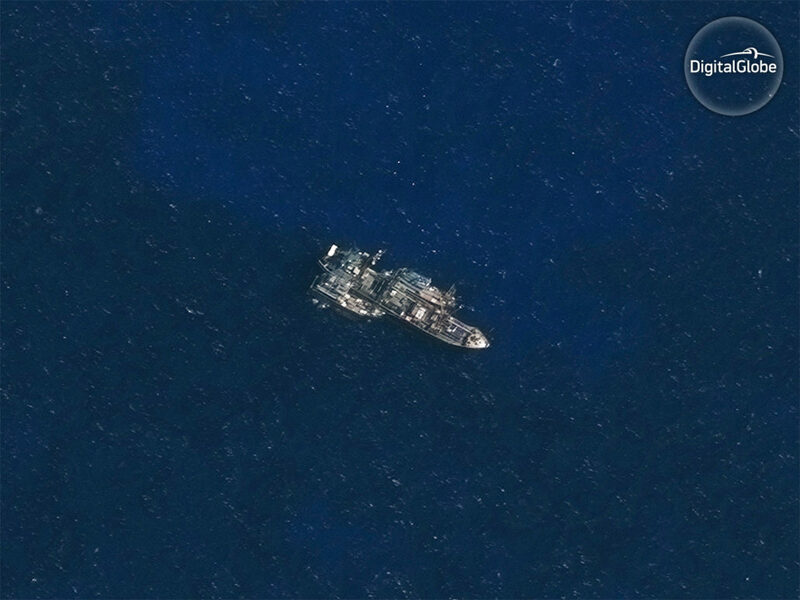 Worldview-3 satellite image of likely transshipment courtesy DigitalGlobe. 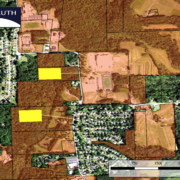 When Paul Woods moved to Shepherdstown, West Virginia, SkyTruth’s home base, he was looking to get away from the Washington, D.C. area where we had been consulting in the tech industry during the dot com boom. His goal had been to find a slower pace and a more soul-satisfying lifestyle than the world of maximizing profit margins through software development. Now, he’s setting off to help save the oceans by revolutionizing the way the fishing industry works. As the Chief Technology Officer at SkyTruth, Paul was instrumental in bringing Global Fishing Watch into being. 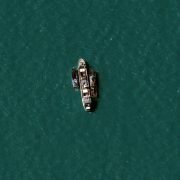 [You can read about that here] Now, the platform we developed for identifying and tracking every commercial fishing vessel on the oceans is spinning off into an independent non-profit organization with Paul at the helm. 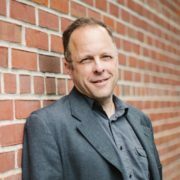 As the interim CEO of Global Fishing Watch, Paul will be guiding the new organization through the transition. While we’re still keeping him in the fold, we thought it was a good time to sit down for a brief reflection on his path, his time at SkyTruth and a look into what’s next. It’s a small town, so I guess when you landed in Shepherdstown in 2001, it was only a matter of time before you and SkyTruth found each other. How did you get involved? It’s true just about everybody in Shepherdstown knows SkyTruth. When I met John (SkyTruth President, John Amos), I was working with another company, but I did a few side projects for SkyTruth. I also joined the board as technology advisor. Then, as the other work was winding down and I was looking for the next thing, I realized I just got a lot more out of the SkyTruth stuff than I did out of creating products to maximize clicks or streamline business processes. In 2010, when the Deepwater Horizon spill happened, I helped John set up a rapid response website. Of course the whole oil spill incident opened an opportunity for growth at SkyTruth, and I realized I could apply my skills in the stuff I really like doing directly to issues that made a real difference in the world. That kind of direct application to saving the environment is so much more satisfying than just writing a check or writing a letter to your congressman. By 2013, I came on full time, and one of the first projects we did was SkyTruth Alerts, which is still in use today. I’m sure it’s rewarding to see Global Fishing Watch mature into its own organization. Do you have any reflections to share as you look back at your time at SkyTruth? Over the years I’ve been working on many different projects at SkyTruth that have been deeply rewarding to me. Now that one of those projects has gotten big enough that it requires all of my time and attention to keep it running, which is enormously exciting. Clearly my immediate hopes and dreams are focused on the continued success and growth of Global Fishing Watch. 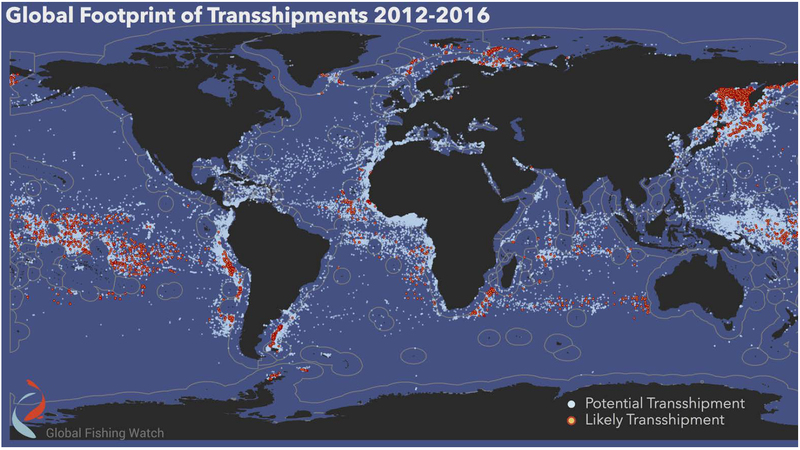 I hope to see Global Fishing Watch arrive at a long term sustainable model that will propel its growth beyond me and be wildly successful at making fishing sustainable and helping save the oceans. Personally, I guess I’m always looking for the next thing. I’m a start-up guy. That’s what I do. It’s what I like to do, so I guess my hope is that there will be another Global Fishing Watch around the corner a few years from now —another project with the same great impact and the same great opportunity to make the world a better place, and I’ll get to be involved in it. There’s a good chance that project is in its infancy right now at SkyTruth. If you could see any place in the world from space, where would it be? Anyplace? Well, we have recently detected new planets only four-and-a-half light years away, and at least one of them potentially has liquid water on it. The surface of Proxima Centauri B. That’s my first answer. Great answer. What about here on Earth. If you could aim the SkyTruth “eye” where would you aim? What would be really fantastic to see from space would be the bottom of the ocean, the sea floor. Unfortunately we can’t do that right now, but I think that would be the place I’d want to see.